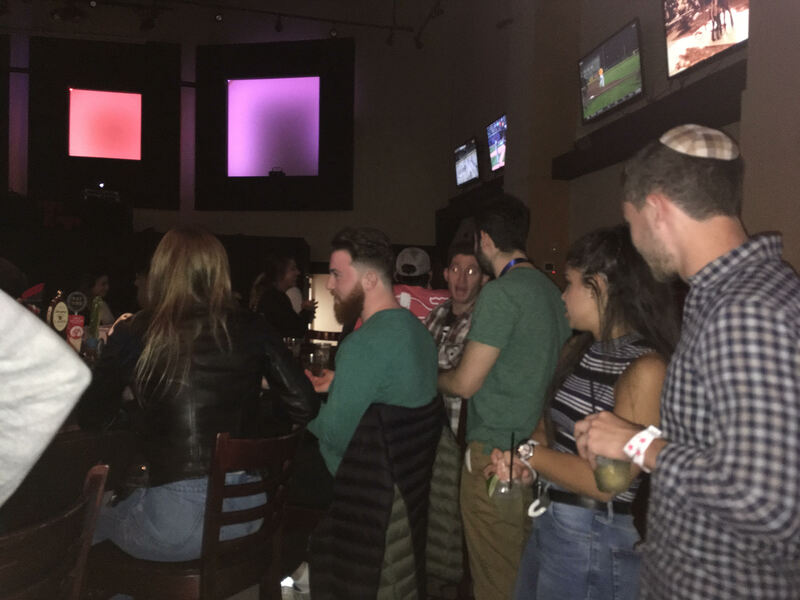 Half the crowd at Terrapin’s Turf on Thursday night came for the National Hillel Basketball Tournament’s bar night, the first event of the jam-packed weekend. This weekend, over 300 players from across the country will gather to compete in the annual basketball tournament. But bar night highlighted the social aspect of NHBT; it was focused on the drinks, music, and of course, the company. Even though he’s not participating in the tournament, University of Maryland alumnus Ariel Efergan came to the bar night to visit his friends. When the night began, only about 10 people sat at the bar, casually chatting. After a while people started to trickle in, shouting and cheering as their friends entered Turf. Those coming for the NHBT event could pay $8 in advance to get on the NHBT bar tab, which they were excited about. “I paid $8. I thought it was an entrance fee, and then they gave me a wristband … and unlimited drinks!” said Morty Schwartz, a student at Yeshiva University. Once the bar started to get more crowded, board members stood near the front to distribute the wristbands. Last year, the welcoming bar night was held in D.C., but the board decided to have it closer to campus this year. “Even though it’s not hosted by the University of Maryland, we do feel that UMD is the home of the tournament,” said NHBT board member Noah Holtzer. To begin NHBT, students gather and socialize with friends at Terrapin’s Turf. Jacqueline Hyman/Mitzpeh. The closer venue was still out of reach for some NHBT participants, who are staying in hotels down Route 1. Additionally, not all the teams have checked in yet; many will do so Friday morning. However, those who were able to make it seemed to have a great time. They danced and sang along as the DJ played from the stage area. Many anticipated the upcoming tournament. This is Schwartz’s first year competing, and he decided to travel to Maryland for NHBT partly because he wanted to be part of something Hillel-related. He’s on the Salutsky team for YU. However, as a Baltimorean, he’s not far from home. Efergan has attended NHBT events in past years, but has never played in the tournament himself. He’ll be rooting for the his alma mater’s teams at the games. “I always love cheering my friends on,” said the 2017 graduate. With multiple teams from the school in the tournament, YU took home two championship wins in the 2017 games. Schwartz said he doesn’t expect to win. “I didn’t bring my good headband,” he joked. The most important part of the tournament really is the friendship and comradery, which the relaxed bar night proved. “It’s not about who wins, it’s about bringing people together around the sport of basketball,” said Holtzer. No Replies to "Maryland students show off their ‘Turf’ at NHBT’s bar night"